The instructions on this page is specific to the 10 Gigabit uplink switches (NETGEAR ProSafe GSM7228S) only. When enabled, the Broadcast Storm Control feature on the NETGEAR ProSafe GSM7228S may interfere with the synchronization mechanism used by OptiTrack Ethernet cameras. For proper system operations, the Strom Control features must be disabled for all of the ports used in this aggregator switch. 1.1 Step 1. Access the IPv4 settings on the network card that the camera network is connected to. 1.2 Step 2. 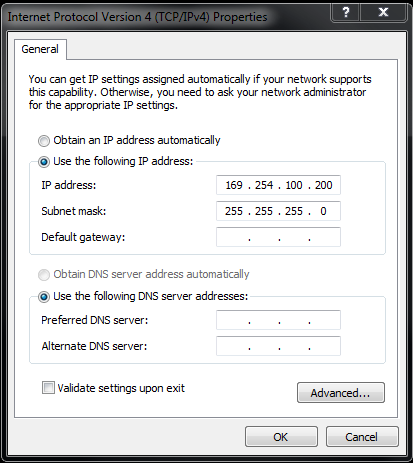 Make a note of the IP address settings for the network card connected to the switch. 1.3 Step 3. Change the IP address of the network card connected to the switch to 169.254.100.200. As shown below. Step 1. Access the IPv4 settings on the network card that the camera network is connected to. 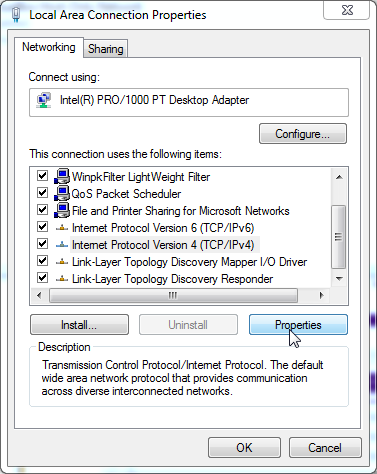 On windows, open the Network and Sharing Center and access Change adaptor settings. Right-click on the adapter that the network switch is connected to and access its properties. Among the list of items, select the Internet Protocol Version 4 (TCP/IPv4) and access its properties by clicking the Properties button. Step 2. Make a note of the IP address settings for the network card connected to the switch. Step 3. Change the IP address of the network card connected to the switch to 169.254.100.200. As shown below. This page was last modified on 2 May 2018, at 14:56.